Raise your gardening efforts to a new level with keyhole gardening. You’ll increase your garden’s productivity in a smaller space, while using less water and fertilizer. This intensive technique was first used in Africa where it’s hot and dry and the topsoil is shallow. Now gardeners growing in a variety of climates around the world are using this technique. You’ll even find keyhole gardens in urban and suburban backyards. Keyhole gardening grows abundant produce while composting plant-based kitchen scraps in one raised garden plot. Grow plants in the outer ring of a circular, 6-feet diameter or larger raised bed. Create an inner circle for composting kitchen scraps, coffee grounds and garden debris. Design a small pie shape notch in the circular bed. This provides easy access to the inner composting circle and gives the bed its distinct keyhole appearance. 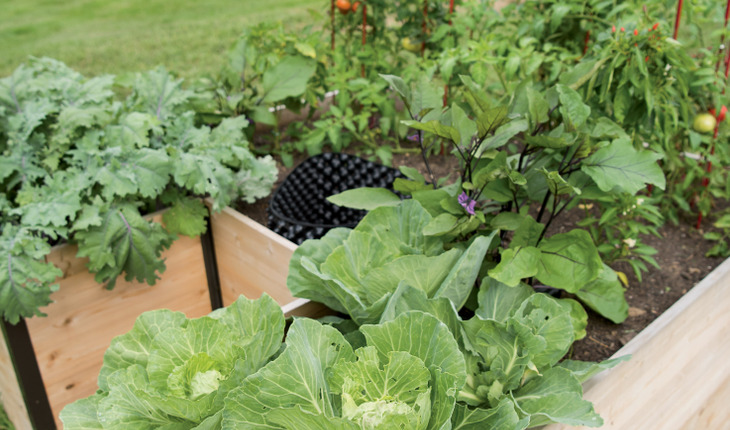 Build the sides of your raised bed garden from stones, cement blocks, bamboo or any available materials that can withstand the rigors of your climate. Select a height that works for you and makes planting, tending and harvesting easy. It may be easiest to purchase a keyhole garden kit. Select a kit with all the basic building supplies made from long-lasting materials, like the Cedar Keyhole Garden (gardeners.com). Once the walls are built, create an inner compost basket. Use chicken wire or a similar material that allows moisture and nutrients to move from the compost basket into the surrounding soil. It should be at least 12 inches in diameter with the bottom anchored to the ground and top extending above the soil surface. Fill the bottom of your raised bed with compostable materials. Start with a layer of cardboard on the soil surface. Then alternate 4 to 6” layers of brown and green materials just as you would when building a compost pile. Use twigs, straw, dried leaves, paper, cardboard and other carbon rich materials for your browns. Include herbicide-free grass clippings, manure, kitchen scraps, fresh plant debris and other nitrogen rich materials for your greens. Add kitchen scraps and garden debris to the compost basket throughout the growing season. As these decompose water helps move nutrients from the compost basket to the surrounding soil. Continue layering until three fourths of the raised bed is filled. Top it off with compost rich soil for plants to root and grow. Slope the surface so the highest point is next to the compost basket. Allow the planting area to settle for several days. Then fill your garden with your favorite vegetables. Leave just enough space between plants so they can reach their mature size. Water new plantings thoroughly. Mulch the soil with shredded leaves, evergreen needles or other organic material to help conserve moisture and continue to add organic matter to the soil. Check the soil moisture and water the garden bed and compost basket as needed throughout the season. Soon you’ll be enjoying the convenience of harvesting and composting in one bed. And you just might find yourself looking for another sunny spot to add an additional keyhole garden or two. Image courtesy of Gardener’s Supply company. The keyhole gardening technique allows you to grow abundant produce and compost plant-based kitchen scraps in one raised garden plot.